When you’re in the hospital, it seems like all you can think about is getting home. Sleeping in your own bed uninterrupted by nurses checking your vital signs, using your own bathroom and eating home-cooked food all make home seem like a much better place to be. While home can be a comfortable place to recuperate, it also has its challenges. 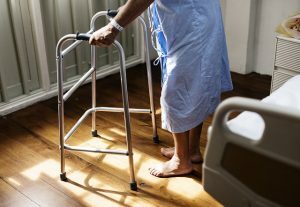 For instance, when recovering from hip replacement you might not be able to get around the house as easily as before surgery. If you were in the hospital for a serious illness, you might be sent home on medication that makes you groggy or you still don’t have the energy to do everything you need to do for yourself. It’s important to think about what you will need in the days and weeks after being sent home from the hospital and do what you can to make the transition as smooth as possible. 1. Pay attention to your discharge instructions. You might be so anxious to get out of the hospital that you hardly pay attention to what the nurse is saying when going through the discharge procedures. But not knowing what you should do can lead to complications that could slow your recovery or even put you back in the hospital. Make sure you pay close attention to things such as what medications to take and when, how to change your dressings and when you should follow up with the doctor. Don’t be afraid to ask questions! The doctors and nurses would much rather take time to make sure you and your caregiver understand what to do than see you back in the hospital. 2. Make a complete list of all medications and side effects. Whether you’ve had pneumonia or gall bladder surgery, you’re sure to be sent home with prescriptions for new medications. Often these are in addition to a few you’re already taking on a regular basis. Keep track of everything by making a list, and seeing the side effects will help you know what to look out for if you start to feel unwell once you’re home. 3. Prepare the house for mobility issues. If you don’t already have them, it might be time to install grab bars at the toilet and in the shower. These are helpful anytime, but especially if you’re weak after a surgery or illness and at risk of falling or getting dizzy. You might also consider a ramp to your front door if you’re using a walker or a wheel chair for a period of time. 4. Stock up your pantry. Many people are lucky to have a community of friends and family who can bring food and casseroles when you get home from the hospital. It’s also a good idea to have the pantry and refrigerator stocked with healthy, easy-to-prepare foods. Whether you’re cooking or a caregiver will be preparing meals, it’s nice to have the food on-hand and not have to worry about getting out of the house. 5. Plan for help with in-home care. In the first days and weeks after coming home from the hospital there might be more medical tasks necessary, such as monitoring blood pressure and tracking medications. Or maybe you just have a number of doctor’s appointments to get to and aren’t up to driving. Rather than depending on family who are already over-taxed, hiring in-home caregivers can help ease the burden. Our team at Piedmont Home Health is well-trained and experienced in handling all types of recovery situations. If you’re planning a surgery or know you’ll be in the hospital for a few days, call us to schedule your own in-home care upon returning home. A knowledgeable, helpful caregiver can be a huge blessing in times like this. For more information on the services we provide, call Piedmont HomeHealth today at 336-724-1197.